An amazing, once in a lifetime, EXCLUSIVE PACKAGE FOR ONE extremely lucky Sting fan to spend quality time with the world-renowned artist. You'll JOIN STING ON A VISIT TO A ROBIN HOOD-FUNDED CHARTER SCHOOL as he teaches a master class in music and gives a private performance exclusively for the students. It will be the Ultimate School of Rock and you'll get to hang out with faculty. This ine class a true Sting fan wouldn't want to miss. Available to either an individual or a corporate sponsor. 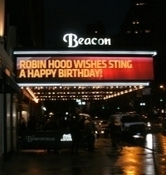 Toward the end of Sting's 60th birthday bash at New York's Beacon Theater last night, Bruce Springsteen took a moment from his set to joke about his friend. "I've known Sting for about 25 years," Springsteen said. "But our friendship is a little unusual, because every time I read about Sting in a magazine, I don't recognize him. I've read, 'Sting can make love for 29 hours.' I wonder why he never mentioned that to me. After four hours now, you're supposed to seek medical attention … Anyway, stay hard brother, stay hard..."